Despite numerous successes with implanted technical systems to support body functions that have been restricted by illness, accident or age, an extended research is needed with the objectives of improved function, greater compatibility and longer durability of implants. A substantial part of the emerging questions is directly connected to the necessity of a profound understanding of the processes at the interface between the implant and surrounding tissue, which in turn requires a detailed knowledge of the electrochemical processes taking place there - if applicable, influenced by externally applied electromagnetic fields. 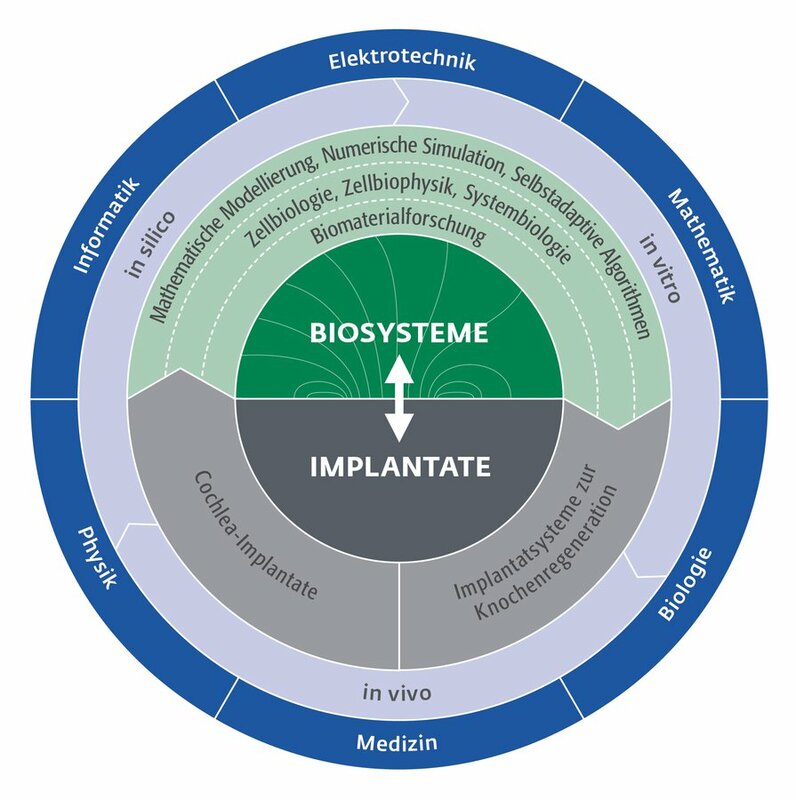 The precise model description of the processes at the interface between the implant and surrounding tissue from both biological and medical as well as from physical-electrotechnical and biophysical-electrochemical point of view is the central research goal. To study these processes, in the first funding period experimental analyses of the adhesion and proliferation of osteoblasts, biophysical experiments on electrical coupling of nerve cell networks with sensor chips, electric field calculations and thermodynamic simulations on different size scales have been carried out. To describe the processes, innovative automated statistical methods and techniques from systems biology have been developed in the last 4 1/2 years. The outcome has direct relevance to the analysis of the electrical interactions between implants and the biological system and thus for the optimization of deep brain stimulation, of cochlear implants and of electrostimulative implant systems for bone regeneration for future clinical application. These findings obtained in the first period will be extended. New for the second funding period are to investigate the influence of electromagnetic fields on bacteria and human cells. Yiyi Lu: Alloy titanium and composite with near-surface structure gradients for implants. Shaghayegh Eshaghian: Uncertainty in interactions between cells and their environment.